Opiates killed 47,600 Americans in 2017 according to data from the Centers for Disease Control and Prevention (CDC), accounting for an overwhelming majority of the deaths that were attributable to drug overdoses that year. Before a person suffering from opioid use disorder succumbs to fatal overdose, there’s a prolonged, often years-long period of indignity, erosion of quality of life and decline in health; a period that is undoubtedly difficult, but doesn’t have to end in relapse. 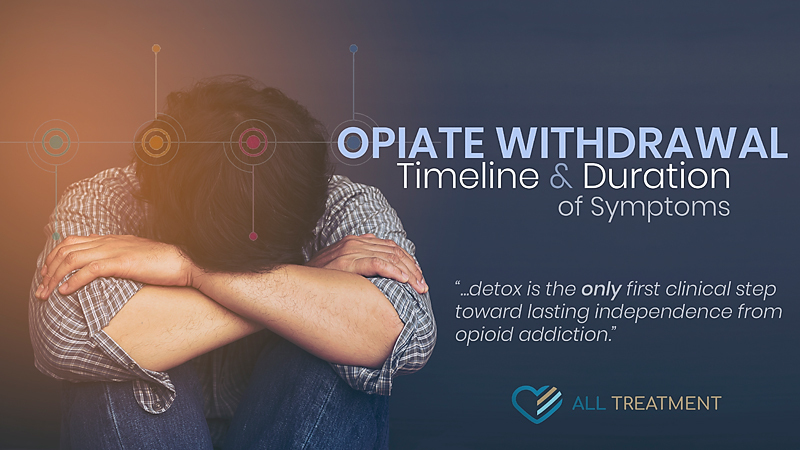 One of the most effective weapons against opioid relapse and the heightened risk of overdose is knowledge, beginning with an understanding of the opiate withdrawal timeline and duration of withdrawal symptoms. Opiate withdrawal is a medical event that occurs when users who have built up a tolerance through prolonged or excessive use are not getting their usual dosage. It is characterized by a variety of physical and psychological symptoms that vary in scope and duration based upon each user’s opiate use history. Those with an extended history or heroin or synthetic opioid abuse are significantly likely to have a more arduous withdrawal period than those who have just started to develop prescription painkiller tolerance. While opiate withdrawal symptoms may vary somewhat by the individual, the process is broken up into three progressive stages: early, acute and protracted. The early stages of withdrawal from short-acting opiates like hydrocodone (Vicodin®) and oxycodone (OxyContin®) tend to manifest between eight and 12 hours after the last cycle of use. For longer-acting or extended-release opiates like fentanyl or methadone, withdrawal symptoms can take up to 30 hours to develop. These symptoms tend to peak after one to two days before giving way to more serious acute withdrawal symptoms. These symptoms generally peak within 72 hours on onset and dissipate to more manageable long-term withdrawal symptoms. The exact combination, severity and duration of symptoms will vary based on each opioid user’s experience, their existing medical conditions and more; this is part of the reason why it’s so important to seek medical help for this process. One of the unfortunate realities of opiate withdrawal is that symptoms can linger for weeks or months after detox. Generally speaking, however, these symptoms are easier to manage with the help of everyday interventions like over-the-counter meds and others. Some of the common long-term opiate withdrawal symptoms include muscle aches, mild depression, mild anxiety, cravings, stomach illness, loss of appetite, constipation and more. Altogether, the average duration for opiate withdrawal symptoms spans two to three weeks. In an effort to offset cravings and other withdrawal symptoms, withdrawal patients may be eligible for certain types of medication-assisted treatment, including Vivitrol® (extended-release naltrexone), Suboxone® (buprenorphine and naloxone) and methadone. It is highly recommended that individuals experiencing opiate withdrawal seek help from a medically supervised detoxification and symptom management. Do I Really Need Detox for Opiate Withdrawal? It’s no hyperbole to say that detox is the only first clinical step toward lasting independence from opioid addiction. Those who endeavor to enter rehab before detoxing are not giving their systems the time and care they need to revert back to normal function. Detox ensures that patients are medically stabilized and cognizant enough to undergo behavioral rehab. It’s also true that those who endeavor to whether the withdrawal process on their own run a significantly heightened risk of relapse and subsequent addiction and possibly fatal overdose. Opiate withdrawal detox generally lasts for three to five days and provides patients with a safe, medically supervised environment in which they can get expert, compassionate symptom relief and have the benefit of intervention in the event of a medical emergency. Does Insurance Cover Opioid Withdrawal Detox and Management? Thankfully, detox is now recognized as a viable and necessary medical procedure by insurance providers; subsequently, there are more and more resources to help you or your loved one get the help you need for opiate withdrawal. For those with limited or no insurance resources, Medicare or Medicaid may be able to pay for all or part of the procedure. It’s important to realize that the cost of doing nothing is far greater than the financial cost of detox. Without proper medical help and ongoing interventions, withdrawal can very easily lead to more serious complications and even death. The National Institute on Drug Abuse reports that relapse rates for drug and alcohol addiction are between 40 and 60 percent. For opiates, these rates are thought to be even higher. One of the primary drivers of this relapse and the fatal overdose it often precedes is because those struggling with opiate addiction never get the proper help they need for their withdrawal symptoms. Don’t become another statistic. Break the cycle that opiate addiction has on you or your loved one and get help now.